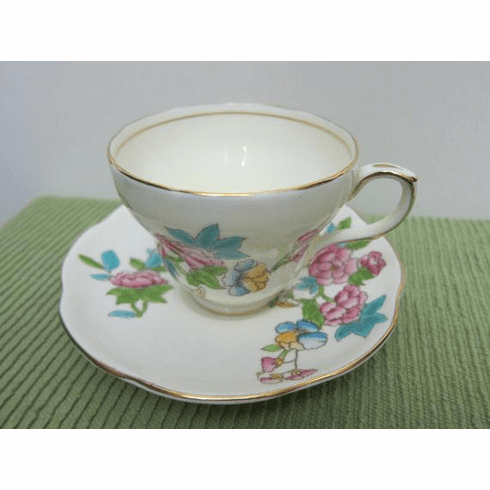 EB Foley tea cup & saucer set. Hand-painted pink roses with yellow rosehips adorn the bone white pieces. The gold is perfect! The Backstamps match: "Lion / 1850 / EB / Foley Bone China / Made in England"
Size: The teacup is approximately 2-3/4" in height. The scalloped saucer is about 5-1/2" in diameter. Bone china. Made in England. Estate Find. This is the only set that I have. Please Note: This item is listed both here, in this independent, online shop and, in my Etsy shop www.RussellAvenueWhimsy.com I only have one of these sets and when it sells from one shop, it will be marked as sold in both shops. Shipping: Please note that this item will need a sturdy box to ship safely in. When choosing a shipping option, please choose an 'Expedited' or 'Express' option that is best for where you are located. Payment Options: Paypal (your choice of currency) to purchase this item immediately and shipping is usually same or next day. Or, choose "Bill Me" and I will send a Square Invoice (Canadian Funds only) and shipping will usually be the day of or, the day after payment is received.